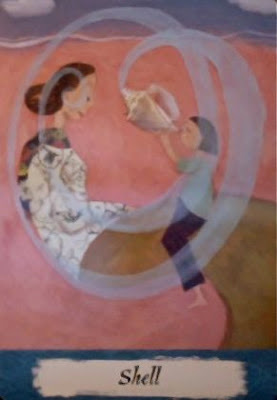 Today's Draw: Shell from the Mother's Wisdom Deck by Niki Dewart, Elizabeth Marglin and Jenny Kostecki-Shaw. Are you a good listener? Are you an equally good sharer? Should what's right for you be considered the right way for others to do things, too? The spiral pattern of a shell not only mimics the workings of our inner ears, it also mimics the spiral walk of discovery as you listen to others tell their piece of the collective truth. I recently had a conversation reflecting this. My friend had had a conflict awhile back with another person. Really no one could fault my friend in being upset at what had transpired and I told her as much at the time. But that was the extent to which I involved myself in the situation, which led some to question why I didn't get more actively involved. So an opportunity came up for me to discuss this with the friend and an interesting thing happened. Her reasons why I should have gotten involved made perfect sense to her and, in the way she explained it, it even made sense to me. But my reasons for why I didn't get involved made even more sense to me...not in a defiant way, but in a way that I can really just see no other alternative if I were to remain true to my ethics, values and beliefs. While I still believe my reasoning is spiritually correct and the right thing to do, I can see where hers is spiritually correct and the right thing to do, too. Yes, there can be two different "right" answers to the same situation. In fact, there can be many. The same goes with the truth. Everything is colored by who we are, what path we're on, what we came here to learn, what baggage we're carrying, what we believe in, what we're challenging ourselves with at the time, where we are in our spiritual development...the list goes on and on. And with each element we add to the list of what colors the situation, the more "right" answers, "right" stances and "right" actions there are. 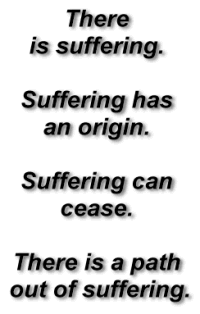 The Eightfold Path to the end of suffering as practiced in Buddhism. In Buddhism, they have what is called the Eightfold Path, which is based on the "right" way of living in order to minimize suffering and eventually reach nirvana. It provides a fairly clear pathway to speaking, doing and thinking the "right" way. Different belief systems will have different pathways to what is right. Families will have their version of what is right. Collective society has different pathways to what is right. Governments have different pathways to what is right. And individuals create their own version of "right" from all the different available options. That version may change over time based on our results and evolving beliefs. There was a time my friend's "right" was my right, but that is no longer the case based on the direction my life and spirituality have taken. By the same token, there may have been a time when someone who shared my friend's beliefs may have thought the way I think now and found it garnered less than satisfying results for them. All of us are good people trying to raise our souls higher, even though we disagree on the "right" way of doing it. When we can recognize ourselves in the faces of people who believe differently than us in this way, we find our oneness...our compassion...our understanding. Path is the path mentioned in the 4th truth. Listening to others is a key tool we have as we shape our spiritual voices. Sharing is also a key tool. I know a few people who tend to listen far more than they share, thinking they're being giving, but giving is found in both listening and sharing. Without sharing, there is little discussion or debate. Without sharing, you never give others the wisdom of your thoughts, nor do you ever put then up for discussion. No one will ever see your way or understand you if you don't share. But just as listening to others and sharing with others is important, it's also important to listen to ourselves. Because there are so many "right" ways in the world, we may find ourselves questioning our own "right". Some questioning is healthy, but too much can leave you moving off the path of your own north star. The trick is not in believing you're right and others are wrong. It's in believing that there are many right paths to take....and yours is not only just as valid as the others, but it's also the most right for you.